I’ve heard many rumours about fishermen having sighted large objects in the deep blue sea off the coast of North Borneo. These are often told in a hushed tone as if the very mention of this would invoke the wrath of the gods. In fact I know of a person who claimed he personally knew where to actually find one. But of course, he warns me, it’s going to be dangerous because the sea around that sunken vessel is known to be haunted. Could it be that the sunken ship is the Dutch submarine, which sank off the coast of North Borneo some 70 years ago? According to this report, a group of divers who were exploring the deep sea north of Borneo found the wreck of a Dutch submarine which sank in the World War II era. The ship has been declared missing for 70 years. According to the report which quoted the Dutch Defence Ministry in The Hague, the submarine, known as Hr. Ms.. KXV (or K16), which had been missing with 36 crewm embers in 1941, was found by Australian and Singaporean divers. These divers must have been acting upon tips-off from local fishermen, the same group of fishermen whom I heard the rumours from. The Borneo giant snake Nabau claimed worldwide fame briefly the last two weeks and might have even been the most blogged mythical creature during the period, overthrowing the likes of Bigfoot and Loch Ness monster. When pictures of the 100-feet shape-shifting Nabau appeared two weeks ago, it fuelled debate around the world whether the pictures were genuine. To many, the pictures were no more than the result of a lousy Photoshop job. I had the feeling that many others had harboured the hope that the pictures were genuine. It is now firmly established that the pictures are fake and the river where the snake was purportedly spotted is not even the Baleh River in Sarawak. The river in the original picture, below, is Congo River in South Africa. Here are several pictures of the Congo Basin. Having established the falseness of the first Nabau picture, we can now safely assume that the other picture, below, is also fake. But then again… the Congo River picture could be the one that is fake. Someone may have photoshopped the picture and removed Nabau from the river to protect it from myth hunters! 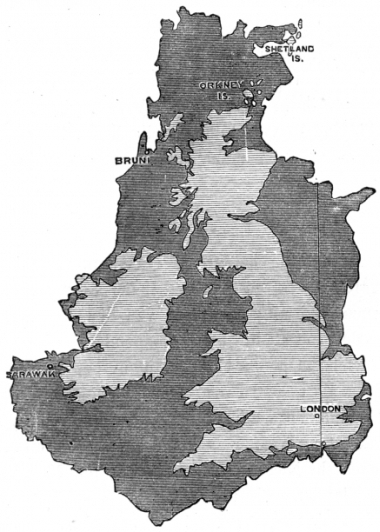 While surfing the web recently, I came across a very interesting map of Borneo Island, with the British Isles “embedded” in it to show just how vast Borneo is. What amazes me is the fact that the map was drawn in the 19th century, an era where global positioning system and satellite navigation, not to mention Google Earth, were still light years away. The map is included in a 1869 book titled The Malay Archipelago by Alfred Russel Wallace (1823-1913), a 19th century British naturalist, explorer, geographer, anthropologist and biologist. Wallace wrote in the book that he dedicated The Malay Archipelago to Charles Darwin, the author of The Origin of Species. The book also has many interesting hand-drawn illustrations depicting the lives, people and the flora and fauna of Borneo and other islands in the Malay archipelago. 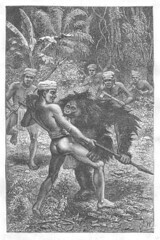 One of the many interesting drawings is about an orang utan attacking a group of Borneo natives. See all the unique illustrations and read all of Wallace’s adventures in The Malay Archipelago here, courtesy of Papua Web. Having solved the mystery behind The Crystal Skull, word has it that the bullwhip-lashing archaeologist, Dr Indiana Jones, was to be flown to Borneo to resolve once-and-for-all the mysteries behind the discovery of two large footprints in Sarawak, rumoured to be those of the mythical Bigfoot. He was already fully-geared for the Borneo adventure — the fedora perched on his head, shoulder bag strapped sideways over the tanned safari shirt, his war-time navy officer’s pants all buckled up, with handgun holster — often with the handgun missing — strapped to the hip, not to mention three days’ worth of unshaved beard for good measure. He was grinning from ear to ear in anticipation of the adventure when he received the news that the footprints were fake. Alas, his grin disappeared (see picture). There goes the greatest Dr Jones adventure, he thought. “It’s man-made and a hoax,” Sarawak Museum anthropologist Dr Charles Leh said, and promptly text-messaged Spielberg, Lucas and Dr Jones not to waste their time chasing after a non-existent primate in Borneo. “Guys, so sori 4 d trouble d nws hav caused. The ftprints were fake. I rpt, d ftprints were fake. To make up 4 d disappoinmt, why dont d 3 of u go 2 d cinema n watch incredble hulk instead. Adios, Dr Leh,” said the text message. Disclaimer: like the footprint, the information above is part fiction, part real. The print is real, the foot is not. — Jaxon S.
A hoax. That has been the general reaction to the discovery of two large Borneo Bigfoot “footprints” in Daro, Mukah, Sarawak. Apparently it got not only Malaysians talking but also other Bigfooters around the world as well. And they are skeptical that the footprints were that of the mythical giant primate, Bigfoot. 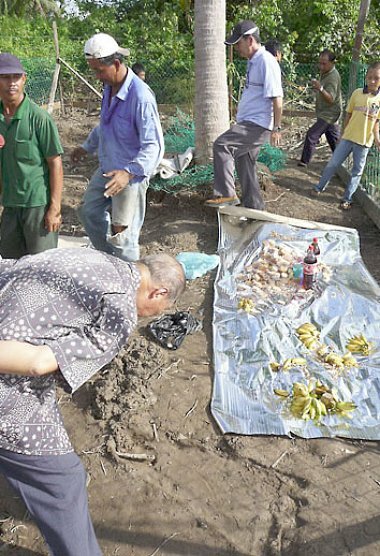 A village in Daro, in the Malaysian state of Sarawak on Borneo Island, is still in a state of shock following the discovery of two very large footprints — measuring 117cm long (47 inches) by 43cm sideways (17 inches) on Wednesday, the Borneo Post reported. “The shocker has been spreading like wildfire in Daro district for the past few days and among those drawn to the phenomenon was local businessman Tan Soon Kuang,” the report said. If You Only Have 7 Days In Borneo, Where Would You Go?